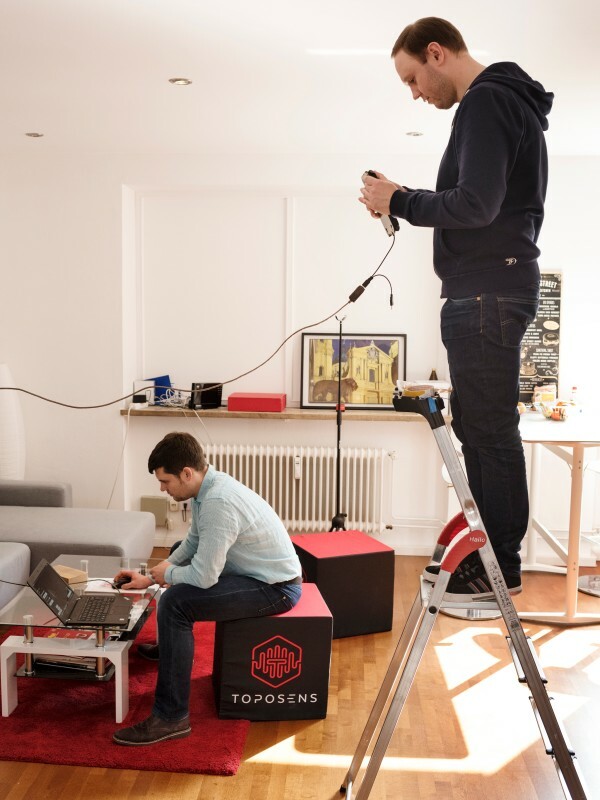 The start-up founders of Toposens from Munich are developing 3D ultrasound sensors to give machines and homes the power of echolocation. This technology will also be important for autonomous driving. 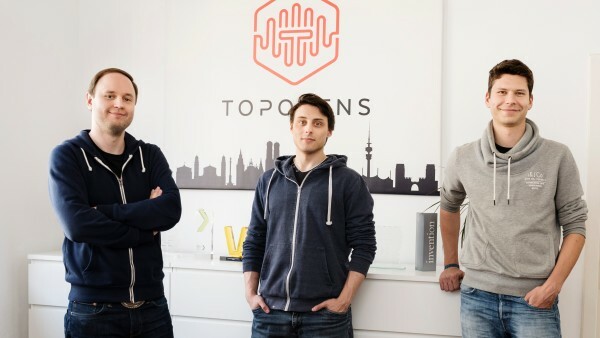 In 2015, the three young professionals Alexander Rudoy, Rinaldo Persichini and Tobias Bahnemann founded the start-up Toposens. Something unusual is underway in a back-courtyard office in Munich. While Rinaldo Persichini alternates between holding up two plastic bottles and a section of drainpipe or placing them on the ground, Alexander Rudoy stands in front of a laptop and tracks the movements on screen. A shiny green coordinate system can be viewed against a black background, recalling geometry classes at school: three axes open up a three-dimensional space. Three objects move inside, appearing as green spots of different sizes. 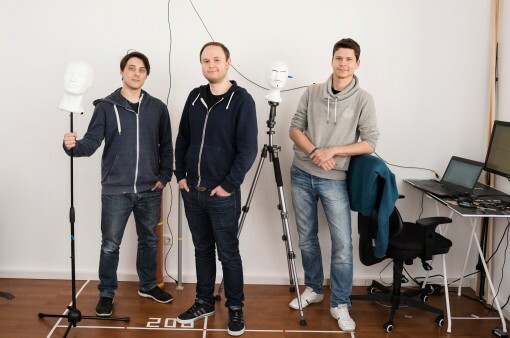 This process playing out on German start-up Toposens’ premises is intended to grant “vision” to machines, buildings and robots. The two entrepreneurs are testing how well hardware and software can collaborate. “You can imagine the screen as a car’s field of vision, the two bottles as other cars on the road and the pipe as a person at the edge of the roadway,” explains the system’s inventor, Alexander Rudoy. The technology behind this is located in a box about the size of two small smartphones, one on top of the other. Since then, development has been going on. In June 20108, a much smaller version of the product – a lightweigh of about 20 grammes in the size of a box of matches – has come on the market. It can now also be delivered in large quantities. The business that started life in various shared flats has now got its own 150 m2 office. “There is no other technology like ours anywhere in the world and it has enormous potential,” adds Tobias Bahnemann, the third of Toposens’ founders: “It can be used in any situation where people and machines interact with one another.” The 3D ultrasound sensors that have been developed operate like echolocation among bats. They send out signals, evaluate the echo that comes back and can precisely detect where in a given space people, animals or objects are located in real time. 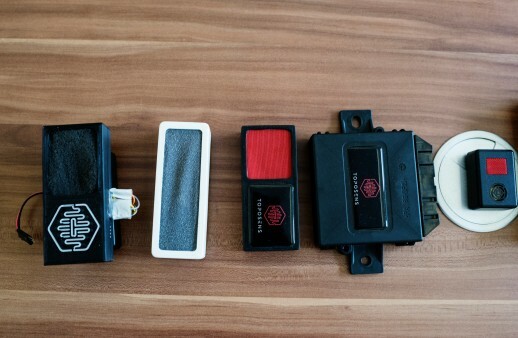 When installed in cars, the sensor system can facilitate autonomous driving, parking or automatic door opening. It can be used to save energy in residential buildings or industrial facilities by only heating spaces that are occupied. Thanks to the sensors, firefighters responding to a call can find out which rooms contain people. Compared with existing, one-dimensional ultrasound sensors, Toposens’ innovative sensor system has a significant advantage: it analyses the environment in three dimensions. “For instance, conventional parking assistance systems in cars only record one-dimensional data, making precise manoeuvring difficult in tight parking spaces,” Bahnemann says. The new development also offers benefits beyond those of camera and laser technologies, he adds: “Darkness, fog, wind and sun do not interrupt the ultrasound, whereas the weather heavily affects cameras and lasers.” In addition, the Toposens technology does not collect any personal data, an important consideration in terms of privacy and data protection. Instead, anonymous movement data is recorded. Read more under the gallery. A collaborative approach - The offices at Munich-based start-up Toposens can get pretty lively. Staff here get to think, tinker with tools, debate and have fun. Three entrepreneurs and their ideas - “Industry 4.0 is a genuine topic for the future” believes Tobias Bahnemann. He makes up the start-up team along with Alexander Rudoy and Rinaldo Persichini. 3D technology - Unlike one-dimensional ultrasonic sensors, Toposens technology scans its surroundings in three dimensions. Prize-winning - Toposens received the distinction of being the winner for the state of Bavaria in the KfW Entrepreneurs’ Award in 2017, a Germany-wide enterprise competition. The offices at Munich-based start-up Toposens can get pretty lively. Staff here get to think, tinker with tools, debate and have fun. 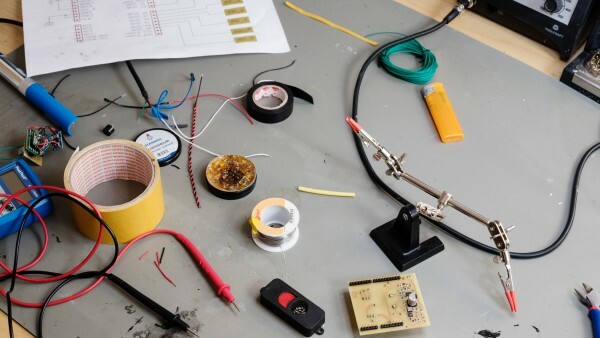 The Munich-based start-up's offices are not only used for brainstorming, they also serve as a tinkering workshop. It was Alexander Rudoy who started to experiment with ultrasound seven years ago. At the time, the skilled communications technician was studying mechatronics and precision engineering at Munich University of Applied Sciences, and dreamed of having a unique robot – a mixture between a toy and a pet. “I came up with the idea of building a robotic fish that would be controlled via electromagnetic fields,” the 32-year-old recounts. He intended for it to look lively and move in water like a goldfish, but to need neither feed nor fresh water. “There was no sensor system suitable for it, so I started to develop an algorithm myself,” Rudoy adds. For three years, he wrote a simulation, programming on his laptop at every moment he had free. In fact, Rudoy never finished building the robotic fish, but developed a business idea for it: His algorithm became Toposens’ key technology. Shortly before completing his studies in 2014, Rudoy went to the university’s business incubator to seek advice. By chance, he met fellow student Rinaldo Persichini there (known to everyone as Aldo). Aldo also had an idea. “But Alex’s was better,” he ventures: “I gave up on mine and we worked together to develop his further.” For weeks, the two engineers tinkered away in a flatshare to make the first prototypes. It became clear to them that they required some business acumen if they wanted to build a company properly. So they took the stage at a conference for start-up entrepreneurs, sharing their vision and their search for a management expert. Tobias Bahnemann was sitting in the audience and was instantly convinced. “The Fourth Industrial Revolution is a huge topic for the future,” Bahnemann states. The 29-year-old had just moved from Münster to Munich with his girlfriend and was looking for a job following his degree in business administration. He approached the two engineers, after which point everything moved at lightning pace. 16 regional winners as well as one national winner were presented the KfW Entrepreneurs' Award in October 2017 for their business ideas. An overview of all winners and more information on the competition are available here. In 2015, the three young professionals founded Toposens, and received the EXIST Business Start-up Grant from Germany’s Federal Ministry for Economic Affairs and Energy and the European Social Fund. At first, they worked from home and coordinated over Skype, before moving together into a small space in the business incubator building. For a year and a half now, they have been working in their own 150-square-metre office with a staff that has increased to 12 employees. The location looks exactly how one might imagine a start-up to look. The premises contain a seating area, a kitchen unit, a refreshment bar and (often) an experimental set-up like the one with the bottles and drainpipes to test out the technology. Straight ahead in the developers’ office, tables are pushed together to form an island, with mountains of cables and tools next to the monitors and keyboards. A 3D printer sits in an open cabinet. Even more tools and small parts fill the table against the wall – a true DIY workbench over which Rinaldo Persichini often busies himself. 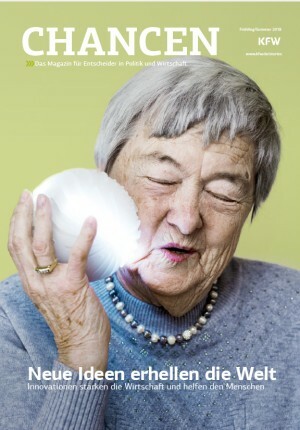 “I very clearly see myself as a developer,” says the 31-year-old, handling a soldering iron. Even as a child, he reports that he preferred “knocking some contraption together” over playing outside. Things were different for co-founder Alexander Rudoy, who notes: “My goal was always to start up a company.” As a result, the division of labour was clear from the outset. While Rudoy works to improve the core technology, Bahnemann attends to business operations. Both are Managing Directors. Persichini is in charge of development and implements customer requests from the development projects. More information about other innovative companies in the spring/summer 2018 issue of CHANCEN magazine focusing on “Innovation”. Toposens received the distinction of being the winner for the state of Bavaria in the KfW Entrepreneurs’ Award in 2017, a Germany-wide enterprise competition. 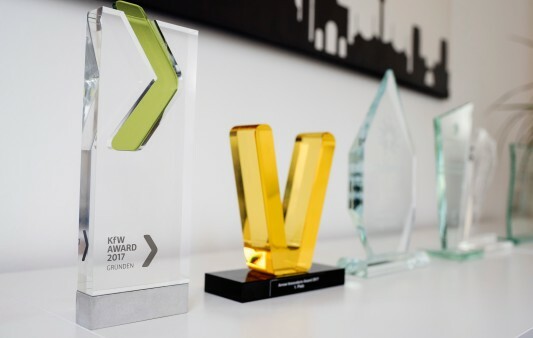 By giving out the award, KfW seeks to stimulate the start-up scene in Germany and put successful entrepreneurs in the limelight. And indeed, other customers became aware of the start-up as a result of awards like that one. “We’re almost exclusively financed through orders and that’s something we’re very proud of,” Bahnemann says. Eight development projects in the automotive industry have already been completed, with others currently underway. A small test lab is located next to the developers’ office. The front section of a car is suspended on the back wall, with its bumper and body wired up. Rods of differing heights have been placed in front of it, with polystyrene heads on the end which can be moved back and forth, as with the bottles and pipe on the floor. “This allows the engineers to simulate situations without constantly needing extras for back-up,” Bahnemann explains, laughing. He cannot reveal what exactly is under development here at the moment, only that “these are preliminary developments for autonomous driving and the question of how a car senses its surroundings.” Customers include BMW, Daimler and Porsche. KfW is supporting business founders in various ways - with low-interest loans as well as with indirect equity investments in fast-growing start-ups. Outstanding start-up projects can receive the KfW Entrepreneurs' Award. The company Munich Composites makes hollow plastic components. 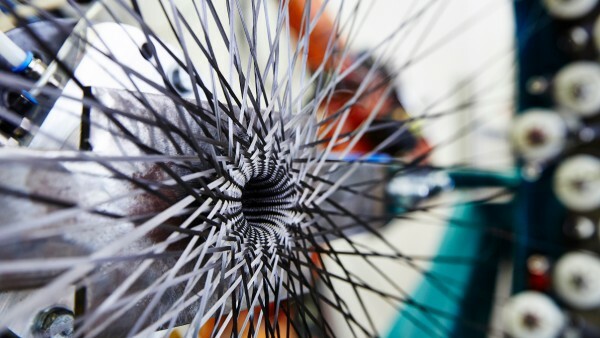 What makes them unique: the parts are shaped by braiding carbon fibres. The production line for series production came into existence with the help of private investors and KfW.